The Streamlight Nano Light is the best keychain flashlight you can buy. I am a flashlight junkie and this little flashlight is hands down the best little LED flashlight you can buy for under $10. The Nano Light is only 1.25" long, weighs less than .35 oz, has a 100,000 hr bulb, and a long life battery for hours of use. The lumen output rivals larger LED flashlights and will illuminate a dark room and projects the beam over 20 feet. A great Survival flashlight, everyday Keychain Flashlight, and a perfect gift Flashlight. 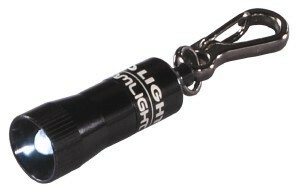 I can "Rave" about this little keychain flashlight all day. Read the full review then go buy one. I guarantee you will not regret the purchase, and will probably go back and buy more. The Nano Light by Streamlight is the best little LED flashlight you can buy. I’m a flashlight addict, I’ll admit that. But out of all the flashlights I own, this little Nano Light is my favorite. It is under $10, only 1.25″ long, lightweight, and man is it POWERFUL! I put powerful in caps because I can not emphasize enough how bright this little, tiny light is. I’ve had mine for over a year now and the light is still going strong. If you are even thinking about whether to buy this little keychain flashlight or not… stop thinking… buy it today! Here is a quick little video so you can see how small it is… I weighed mine on postage scale, and with the clip it was .35 oz. – Very light weight. Click here to see current price, color selections, and over 1,350 reviews. The Streamlight Nano Light is the perfect survival kit light with over 100,000 hour LED life and a long life battery. This keychain flashlight is also the perfect gift. I gave one to all my son-in-laws and grandson last Christmas. I also gave my wife a pink Nano Light for her keychain – she loves it. My step-daughter loved the Nano Light I gave her husband so much I sent her a pink one for her keychain. OK… I’m not “selling” on this site, just reviewing… but I love this little flashlight so much I couldn’t help myself. You can find it on Amazon here… or click ad below (Amazon ad below will not show if you have ad blocker turned on). Come back to this page and leave a review and let me know if you agree with me that the Streamlight Nano Light is the BEST little keychain flashlight you have ever seen.